WHSAD students work with P.S. 257 students on the initial stage of their bridge designs. Building bridges from high school to future ventures has been a cornerstone of a WHSAD education. Students take advantage of internships, college tours, and extracurricular activities that permit them to develop professional habits of mind and pragmatic skill sets. Looking forward has always been vital to the success of any individual and so WHSAD students are now helping students in elementary school do just that. Each week students from P.S. 257 join mentors from WHSAD to learn more about the design process and what our school has to offer regarding interesting paths in architecture. These elementary school students get early exposure to some of the sophisticated programs a school such as WHSAD has to offer and interact with some of WHSAD’s most dedicated students who certainly provide the types of role-models that encourage scholarly enthusiasm and inquiry. But one cannot say that it is only the elementary students who benefit as our high school mentors learn how to patiently handle themselves and develop skills that allow them to empathize with and adjust to the needs of those students under their tutelage. Additionally, WHSAD itself benefits as we now know we have some great students coming to us in the coming years. Below, Sophomore Quiller Augustin provides his thoughts on being part of the mentorship program. Sophomore Dajour Williams provides insights regarding bride design and the meticulous nature needed for such a task. 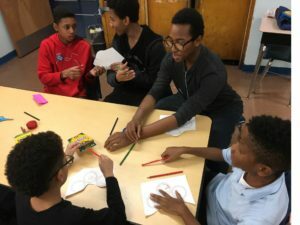 WHSAD has a program mentoring 5th graders in architecture. This program is a chance for community service hours and to help the next generation learn more about architecture. The sessions are either held at P.S. 257 or WHSAD. We will be teaching them about the different types of bridges and help them build their own out of balsa wood. After that we will be doing one-point perspective and two-point perspective. We have had two sessions so far. 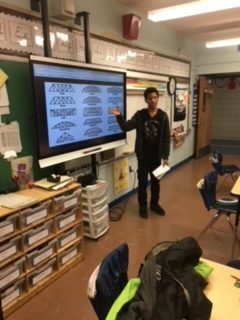 On the first sessions we were at WHSAD without the kids drawing different types of bridges to give examples of what to do. On the second session we went to the school. 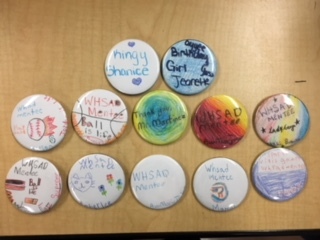 Everyone introduced themselves and then we helped them make pins. Then we introduced them to bridges and they started to make drawings of the one they want to do. It has been a fun learning experience so far for the kids and the mentors. Some of the pins P.S. 257 students designed during their initial mentoring session.